Two CVS Pharmacy colleagues, Danielle Salant, a store manager, and Lee Ashby, a shift supervisor, were recently honored with a 2018 Employer Award from Creative Workforce Solutions (CWS). CWS is one of many organizations nationwide that CVS Health has partnered with to ensure that meaningful job training and employment opportunities are available to individuals from diverse backgrounds. 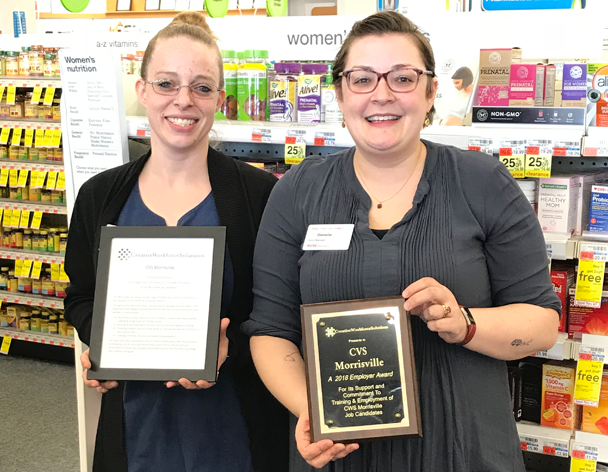 At the CVS Pharmacy in Morrisville, Vermont, where Salant and Ashby are employed, colleagues and local job seekers are provided with job training and employment opportunities through the CWS partnership. Operated by the Vermont Agency of Human Services Department of Disabilities, Aging and Independent Living Division of Vocational Rehabilitation, CWS represents a coalition of employment programs across the state and helps to streamline job placement. Over the last three years, Salany and Ashby have played instrumental roles in the partnership between CWS and CVS Health. “They have created and provided a friendly, inclusive and welcoming workplace, hosting customer service and cash register trainings, assisting candidates to learn on the job and gain employment,” CWS Business Account Manager DJ Masi said. We are better able to fulfill our purpose of helping people on their paths to better health when our workforce is representative of the millions of patients and nearly 10,000 communities we serve across the country. Therefore, we believe that attracting and retaining a diverse workforce is a key component to our success. Through a set of workforce initiatives aimed at recruiting, hiring and developing youth colleagues, mature colleagues, colleagues with disabilities and colleagues with a military background, we work with partners like CWS all across the country to ensure qualified candidates have access to meaningful job training and employment opportunities with CVS Health. “These creative, productive partnerships provide a great learning opportunity for community members and allow our staff to promote CVS Pharmacy as a great place to work, meeting motivated candidates who at some point may become employees,” Rick Laferriere, CVS Health Workforce Initiatives Lead Manager, said. Our hiring program gives individuals with disabilities the chance to succeed with CVS Health. CVS Health is strengthening its workforce by recruiting mature workers. Our STEM-enriched, nationally recognized program that introduces students of all ages to career opportunities.